This product worked great at getting rid of odors in my shoes. 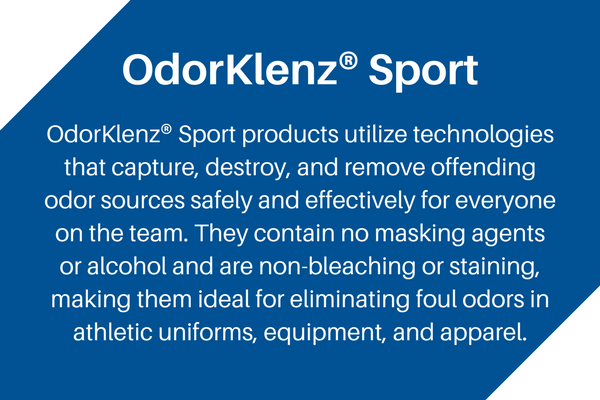 I play in a softball league and prior to trying OdorKlenz Sports Powder, I couldn’t find anything strong enough to get rid of these odors. Now I just dab some on and I don’t have to worry about the odors after the game. I’m a runner and I live in an apartment so I can’t just leave my stinky running shoes outside. With OdorKlenz, I can put my shoes in my closet and not worry about them stinking up the rest of my clothes. My daughter is on a traveling volleyball team and if it weren’t for this product we would be replacing her shoes on a monthly basis. Thank you so much!! As a Bikram Yoga teacher, I have lots of sweaty yoga clothes at the end of each day. I had several items of clothes that I thought were headed for the trash because I could not get the odor out. I found your product online and thought it was worth a try. I was thrilled when all the clothes came out of the wash odor free. 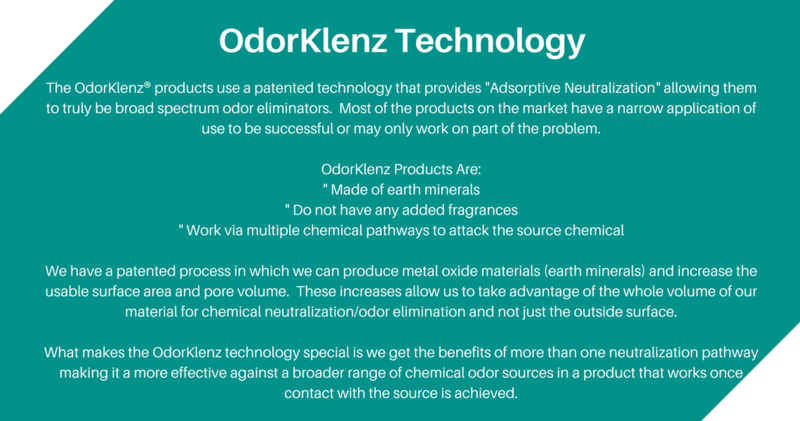 I love that odorklenz does not add scent to the clothes. After trying the product I purchased a case of laundry liquid. I highly recommend this odorklenz liquid to anyone who has smelly workout clothes. We rent a space where one of our roommates is highly allergic to cats and we happen to own three!! We were worried we would have to move because of the issue that the cat dander was causing to our roommate friend, we purchased this air purifier and leave it in the living room where the cats spend the most time in. I can honestly say that since we have turned on the system our air is a lot cleaner and there is literally no hair to be found anywhere and best of all our roommate can bow actually tolerate being around our cats. 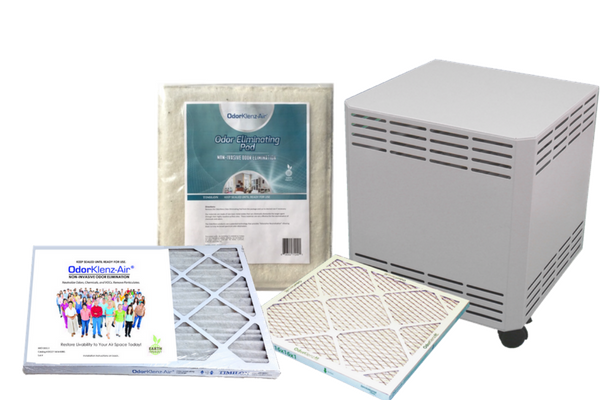 I would highly recommend using this unit for those who have allergies or need to control odors and dander. We own an athletic club in downtown Columbus and had a tough time controlling the odors down in our treadmill and elliptical sections. We decided to purchase two system after receiving some complaint from a guest on the musty and sweet smell (we are known to be a very very clean club). Once we installed the two units it took about 24 hours for the odors to go away and since the implementation of these units we have had 0 complaints but instead received compliments on our proactive approach for treating the air. Since then we have purchased units for our spin room, two locker rooms, and spa rooms and are very pleased with the results. 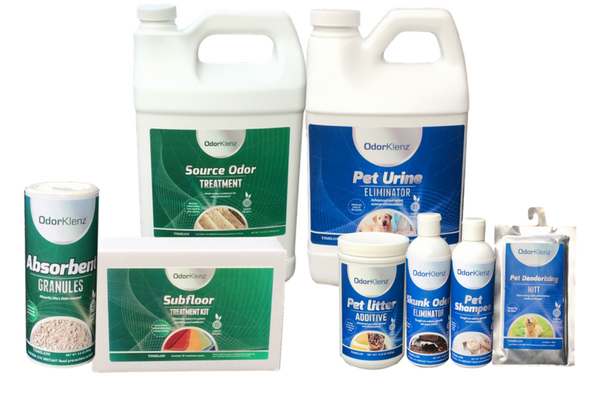 We have three unit set up at three of our grooming locations in Fl and have had nothing but success in controlling pet hair and odors. My only problem now is trying to get the puppies not to try to whiz on it ???? We use this unit to control odors from our 4 cats litter box, although we do our best to keep it cleaned and changed that can be very tough when having to work and manage 4 young children. 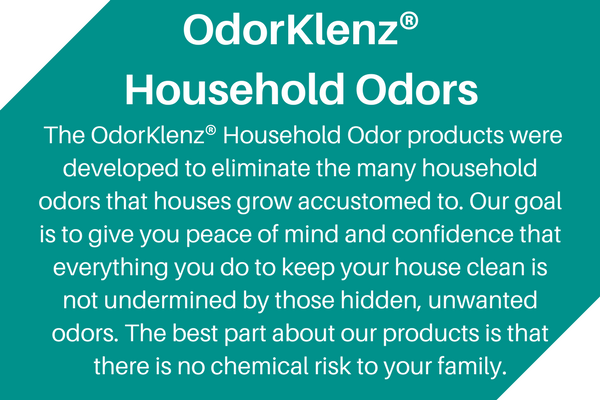 Our OdorKlenz machine helps keep the odors down and from spreading throughout our home and for that I give it 5 stars!! I used OdorKlenz Laundry on Sunday afternoon, on the vomited-upon and defecated-upon clothing from our little bout with stomach flu last week. It worked beautifully — took all the stains and smell out. I have had many successes with the OdorKlenz-Air Cartridge. It is hands down the best new product in the industry in the last 10-12 years. After 2 1/2 hours, I could not believe the odor had been eliminated completely. We were very impressed. 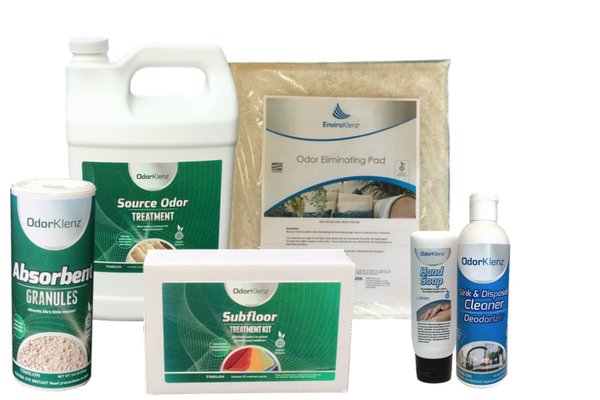 After seventeen years experience in the cleaning business, I have found OdorKlenz treatment effectiveness’ far beyond normal chemical process capabilities currently available to the professional carpet cleaning industry. Regardless of how many times I washed my bath towels, I could never seem to get the musty smell out. They seemed clean, until you put your nose to them, and there was that horrible smell. 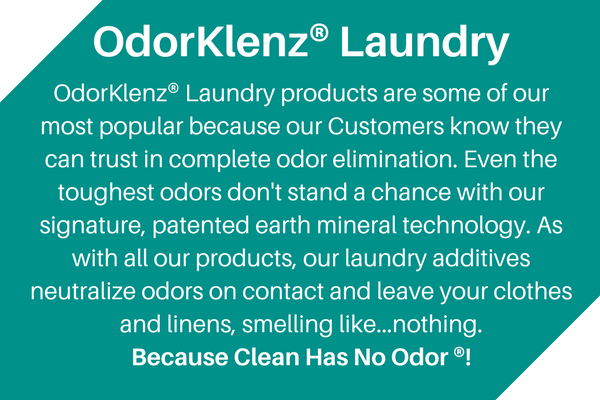 I tried OdorKlenz Laundry on my towels and after one wash, the musty smell was gone for good! A basement was filled with 1-inch deep sewage. The smell was the worst I’ve experienced in my history with ServiceMaster Clean. The air scrubber with an OdorKlenz-Air Cartridge ran for 3 hours. We met the Customer upstairs and to their satisfaction and our surprise, the odor was gone. It far outperforms any other filter. It just works. 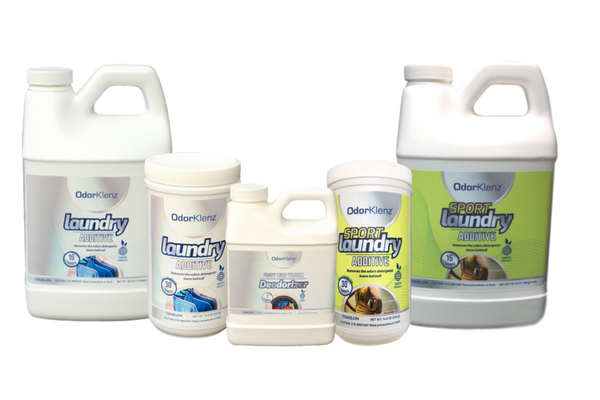 Your products are the best on the market, thanks for making my laundry fresh smelling and clean! Just wanted to follow up with you about the clean smelling carpet in the stairway! …the carpet looks newer and is odor-free! Thank you… it has made a huge difference in the quality of life in the living room! Our Golden Retriever had an unplanned meeting with a momma skunk and her babies and we used your product and we could have him back in bed with us! Thanks so much!!! My husband is a diesel mechanic and unfortunately I am responsible for washing his filthy clothes. He was complaining about the diesel odor (this was after washing them) so I found OdorKlenz online. It is amazing. No more odor on his clothes or in my washing machine. I love this product. It works like nothing else. I used OdorKlenz Skunk Odor Eliminator on my hunting dog. It worked better and faster than anything else I’ve tried. I won’t go hunting without it. We tried the [OdorKlenz] product at all 9 of our elementary schools in Manhattan. Faculty members found it was far superior to our current product. They were able to contain the vomit spill, completely neutralize the odor, and easily clean up the remaining dry material. The pet stuff worked good… my baby had no smell at all after her bath … she just smelled like nothing! It was cold when I put it on her so she didn’t like that, but it worked good … I will use it again if a skunk gets her ever again!!! Thank you! We washed some clothes and forgot them in the washer. After several days we found them smelling very musty. We washed them again with just normal laundry soap and the smell did not go away. 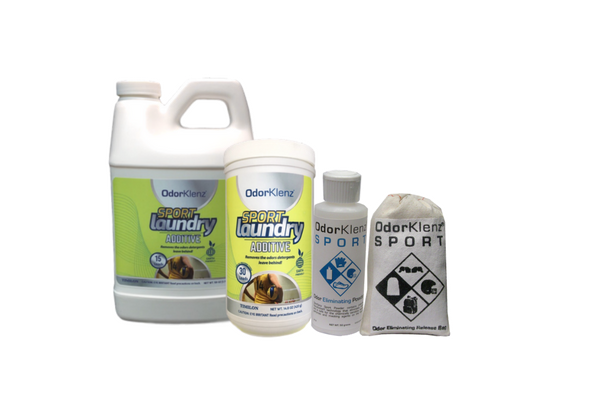 We washed again with approximately half a cup of OdorKlenz Laundry Additive and the smell was gone! My husband is a helicopter mechanic in the U.S. Army. Every day he comes home reeking of jet fuel! It doesn’t matter how many times I wash his work uniforms, or what I use, the smell just won’t come out. I can’t even cover it up with the smell from laundry soap or softener. So, I tried washing the uniforms in water with just the OdorKlenz Laundry, and the results were incredible! ….No more smell at all! I need more of this stuff to use on every load of laundry! A meat-based casserole was accidentally left baking in the oven of a large 2-story home. It remained there continuing to burn for several hours. Two air scrubbers with OdorKlenz-Air Cartridges were placed in the home… After only 45 minutes, I could not smell a trace of the horrible protein smoke damage. The homeowners were thrilled to be able to re-enter their home to check belongings. I knew instantly that this was what I’d use for all of my odor damage jobs. I was ready to throw away every bath towel in my house before I tried OdorKlenz. After using this product one time the odors in my towels were completely gone. I had tried every kind of detergent and fabric softener but nothing worked as good as this. So, we had the unfortunate opportunity of using the [OdorKlenz] last night. It worked great. My sisters-in-law and I trade off on doing their mothers laundry-This is absolutely the best product we have found for getting the urine smell out of some of her clothes. Other products required several washings and still was not satisfactory. [OdorKlenz] worked great! It cleaned up so easy and there was no smell. I just sprinkled it on and cleaned it up with a dust pan and broom and vacuumed up the little bit that was left. I would definitely use it again, it is a whole lot easier than what we have been doing to clean up vomit. As a Bikram Yoga teacher I have lots of sweaty yoga clothes at the end of each day. I had several items of clothes that I thought were headed for the trash because I could not get the odor out. I found you product online and thought it was worth a try. I was thrilled when all the clothes came out of the wash odor free. 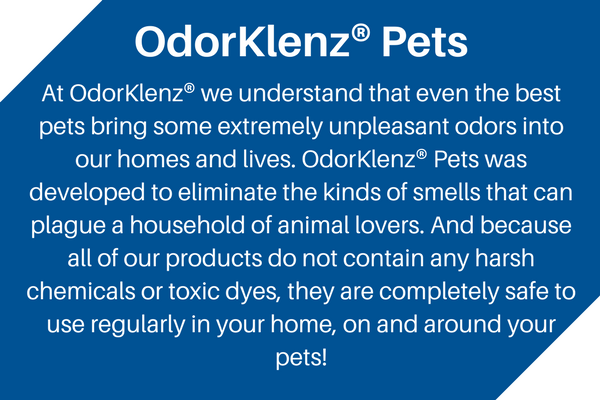 I love that odorklenz does not add scent to the clothes. After trying the product I purchased a case of laundry liquid. I highly recommend this odorklnz liquid to anyone who has smelly workout clothes.